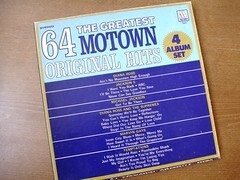 You like the Motown sound? Bob Babbitt, bass player extraordinaire, was likely responsible for that. He passed away on July 16, leaving behind a huge legacy and body of work. He played bass for Motown’s studio band, The Funk Brothers from 1966 to 1972. This would make a lot of people very familiar with his work, without realizing it. He was the bass player on such hits as Stevie Wonder’s “Signed, Sealed, Delivered, I’m Yours“, Smokey Robinson’s “Tracks of My Tears” and Freda Payne‘s “Band of Gold”. He also played with such greats as Phil Collins and Jimi Hendrix. Very diverse portfolio. Here are a few tracks. This entry was posted in Funk, Live Music, Music History, R&B, Remembering and tagged Bob Babbitt, Funk Brothers, Motown, Music. Bookmark the permalink.